Cameroon President Paul Biya arrives at the May 20 Boulevard for National Day celebrations, in the Yaounde, Cameroon, May 20, 2018. Cameroonian political parties have criss-crossed the country ahead of the presidential elections on Sunday. Except for one candidate, none has been able to organize campaigns in the restive Anglophone regions. 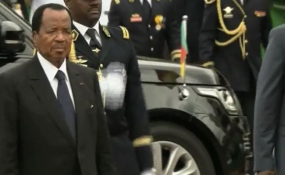 On Thursday, President Paul Biya's campaign team came under gun fire as their convoy was driving top speed through the main highway into Buea, capital of the English-speaking southwest region. Several supporters of the ruling CPDM party were injured in the gunfire exchange between government troops and armed separatists. Biya himself was not part of the Buea campaign convoy. One of Biya's party official Gerald Ngalla told DW that "the president was worried that his presence in Buea could lead to further bloodshed." Prince Ekosso, head of the United Socialist Democratic Party, believes the election will be flawed. "It is impossible for credible elections to take place in the northwest and the southwest," Ekosso said. Ekosso's party, which had maintained a traditional support base in the south, could not hold any rally in the restive region, due to threats by the separatists, who have vowed to stop the elections in the Anglophone areas. "As a matter of fact, the towns and cities of the northwest and the southwest have been deserted," Ekosso said. He added that: "It's already late now for anything to be done for free and fair elections to take place in the two regions." "They want to provide the solution through their political lenses," said civil society leader, Willibroad Ze Ngwa urging the ruling CPDM party to call for peace. He said the party should stop giving the impression that it can solve the crisis through war. "It is only their political party that should be able to provide the solution to the problem and we say no. We are saying that Cameroonians from all works of life should get to the field and talk to the people in a tone of appeasement, keeping their political jackets by the side." However, Enow Abrams Egbe, chairman of the electoral commission Elecam, believes otherwise. "I am just coming from the northwest and the southwest, the situation is perturbed but serene in a way that all the material is on the ground," he told DW. "The security is working hard, leaving no stone unturned to make sure that voters go to the poll free and fair. I am only assuring them that there will be no fright," Egbe said. 6.6 million voters will be expected to cast their ballots at 25,000 polling stations all over Cameroon on October 7 to vote their new president. The divided opposition has failed to present a single candidate. Presidential candidates have been encouraging voters to cast their ballots. Prophet Frank Ndifor Afanui, a candidate for the opposition Cameroon National Citizenship Movement, is the only one to travel to the restive southwest region so far, with a visit to Mutengene. In Cameroon's capital Yaounde, opposition Cameroon Renaissance Movement (MRC) candidate Maurice Kamto suggests the separatists should allow people to vote as the only way to change the system they have been fighting. "They will not win the war, so why continue fighting that war? Is it a solution for a country in crisis just to split into two parts just because we maybe have a government which is not listening to them? Go and vote because it is the only solution. We do not have to sacrifice our people," Kamto said. Social Democratic Front (SDF) candidate Joshua Osih said he sees a solution to the conflict. "The problem is not the secession. The problem is the marginalization and injustices that lead to that secession. The secession will not necessarily solve that problem," said Osih. Elecam has vowed that those who have been "displaced will be able to vote," according to the organizing body's regional director Amadou Ali. "They're not just displaced people - they are voters. The fact that they've been displaced will not have any impact on the election." He added that people without their documents will be able to register to vote in the towns where they have sought refuge. "It's not true, I wasn't able to get a voting card," retorted Yagana, as she rested on a mat. "I've requested it but a local official asked me for 40,000 CFA francs ($70, €60)." But Cameroonian analyst at the International Crisis Group (ICG), Hans de Marie Heungoup, believes only "one-third of those displaced in the far north are registered on the voters' roll." The region is Cameroon's most populous and it's poorest and has previously voted overwhelmingly for President Paul Biya. The army has been deployed to the two restive regions to battle separatist fighters since the end of 2017. According to the ICG, the secessionists control "a significant proportion of rural areas and main roads" in the regions. Skirmishes are violent and occur frequently, displacing thousands of local residents. 246,000 people have been displaced in the southwest, according to the UN, while no estimate exists for the northwest region which is largely inaccessible to aid groups and journalists. Elecam has also said that some polling stations will be "relocated" in the Anglophone region which has traditionally been a reliable well of votes for the main opposition Social Democratic Front (SDF) whose candidate is Joshua Osih. He has described the planned "relocations" in interviews as "an illegal measure" that could damage his chances.